I am a big fan of oil finishes. The poly has too much shine to suit me. Kinda like plastic. I have refinished a couple of garands and some shotguns and .22s. Guess it boils down to preference really. Remington has been big on the plastic finish look on 700 BDLs for a long time. I used Minwax wipe on poly (urethane). 3 coats, took it down with 0000 steel wool and used Minwax furniture polish. Seemed to finish pretty good. I agree...Minwax wipe-on poly (I like clear satin) replaced tung oil for my purposes. It looks just like tung oil but is more durable. It's easier for me to use as well. House does Polyurethane hold up to heat on the handguards? I've been using the CMP method for several years now and the results are excellent. I've done K98k's. 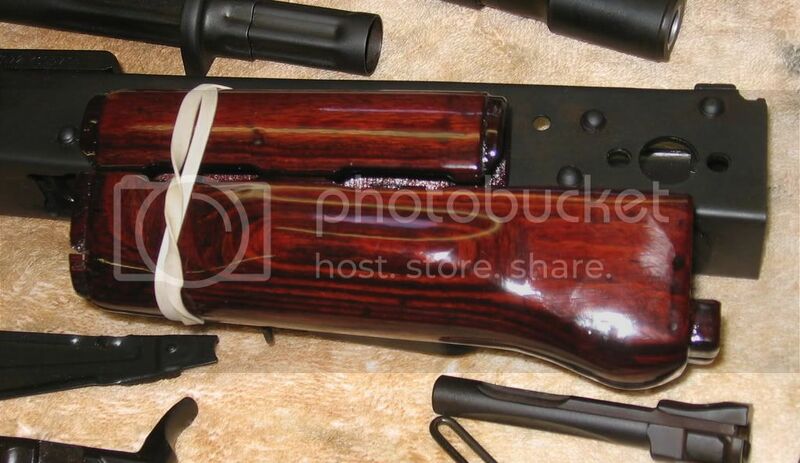 K-31's, Yugo's, Mosins, etc., and all have turned out fantastic with smooth silky finishes that leave the wood feeling like wood and not plastic. The resulting finish seals and protects the wood but can be easily touched up if you get a ding or scratch. The poly finishes can be very hard to repair without stripping and starting over. The only changes to their formula I've made are the use of Formby's Tung Oil Finish instead of the Minwax and I usually use the Minwax Sealer/Stain with the color I want in the stock instead of using a separate stain. Here's some pics of both. Like everyone mentioned, poly gives a clean clear plastic like shine. Tung oil is more natural and really great in it's own right. Tung oil on teak stock set from Iron Wood. Clear satin spray on Minwax poly on PSL stock. Clear gloss spray on Minwax poly. Tung oil is awsome. Easy to use and can be reaplied any time. 660 round mag dumps won't catch it on fire.